Yesterday I was fortunate enough to be able to take my friend Ari flying. He may not know it but he’s actually my aviation mentor – one heck of a nice guy who has a knack of thinking about general aviation in ways I haven’t thought of. He’s a commercial instrument rated pilot with more than 1500h and he flies a FIKI Cirrus SR22T with his father. One reason we are buddies is that we have similar outlooks on general aviation safety and doing GA correctly. My feelings on these are borne out of lots of reading – his I suspect are from lessons learned in years of flying. It can be daunting flying with a significantly more experienced pilot in a non instructor/examiner situation (OK, it can be very daunting flying with an examiner) because one feels like one’s skills are on show – this was the first time I was to be PIC in my aircraft with him (I’ve flown in his aircraft many times). You don’t want your first flight with a new passenger to be your last flight with that passenger.. I must confess to feeling that the Sling was a little shabby compared to the extremely well equipped G5 Cirrus but hey, an airplane is still an airplane – and I’m a proud owner. We had a secondary objective and that was to test the Aerox system I acquired recently – it seemed prudent to do this with an experienced supplemental oxygen user. We came prepared – he had 2 oximeters and I had 1. Of course, true to form mine was DOA, although after 10years of hard use in my day job meant I shouldn’t be surprised. It is time for a new one anyway as the LCD display isn’t very readable in the bright cockpit. In addition we had an emergency cylinder in case the main cylinder didn’t perform as expected. For a change the weather was playing along really nicely and although the visibility wasn’t really good, the air was smooth as we climbed energetically away from BaraG – had a good 750-800fpm climb rate which impressed my passenger. There was no other traffic in the training area and we started our climb after exiting from under the Johannesburg TMA. Information approved our climb and handed us over to the area controller (Centre) and I handed control over to Ari. For the last day in March it was still pretty warm – was showing an OAT of 21 Celsius at 10000ft but the Sling trundled on at 400fpm through 11000ft with the Airmaster Prop in Climb and 34” manifold pressure on the throttle. We routed south as we climbed, out over the Vaal River and Parys, enjoying the views (despite the limited vis) and the smooth air. Climbing through 10000 feet I popped the pulse oximeter on and was quite alarmed to find my sats were 89%. I wasn’t expecting it to have dropped so low at a relatively low altitude. I didn’t feel any adverse effects although I don’t believe time of useful consciousness is an issue at this altitude. However, it seemed like a good idea to get the oxygen on which we did. Let it be said that one looks a little ridiculous wearing an oxysaver cannula – but you look a lot less ridiculous with the cannula on than slumped over the controls with two fighter jets on your wing. The oxysaver allows pretty low flows – <1litre per minute at altitude up to 15000ft – by using a small reservoir so it’s relatively economical to run once you’ve forgotten the initial outlay for the equipment! Area control came on asking us to stop our climb at FL125 due to other traffic on the airway above us which was a little disappointing but the density altitude was already well over 14000ft by this time, so I didn’t think with a service ceiling of 16000ft we’d get much higher anyway. At this point we noticed that the oil pressure had decreased to 1.6bar from 2.5bar. Lower limit of normal is 2bar on the Rotax 914UL. This was obviously not something to take lightly. Initially we thought it could have been due to the warm conditions – oil temp was normal and CHT’s were within limits. Still, we arrested the climb and throttled back with no improvement. The best call at this point was a 180deg turn and route back to home base keeping a good lookout for potential off airport landing sites. We had to descend to avoid busting airspace and as we descended below 9500ft the oil pressure recovered to normal and stayed there, going up to 3bar as we leveled off at 7000ft. Given that there was no other indication of abnormality we felt it was reasonable to do some maneuvering while keeping an eagle eye on the engine gauges. One touch and go then a full stop landing and it was time to put the plane away. I did get some constructive criticism of my crosswind landing – I need to try and land upwind of the centreline rather than ON the centreline – this makes sense as it gives one a few more metres to deal with any squirrelly behaviour after touchdown. I was supposed to fly to Middelburg(FAMB) this afternoon to camp at the AeroClub of SA Airweek being held there this weekend. The weather, it seems, had other ideas. I was delayed by 30min at work this morning and by the time I arrived at the airfield the storm line was developing. I hung around finding things to do on the plane until 16h00 local by which stage I could probably have found a route but the flying time would have meant an after dark arrival – and I’m not night current at the moment – not landing at an unfamiliar field at night thank you very much. The proposed route – see the problem? Waiting for the rain to stop…. My brother-in-law’s family have a place in a game reserve called Zebula – we have driven up with them a couple of times before for the weekend – the house is great with a pool and a jacuzzi and it is good to hang out with family. The reserve has an airstrip which is well frequented with breakfast runners – the lodge will pick you up from the airstrip, deliver you to the buffet breakfast and return you later to your waiting aircraft. Every time we have been before I’ve looked at the airstrip and thought – “this would be a great fly-in spot.” The strip has a bit of a reputation for being difficult – mostly because it gets very hot in the Limpopo Bushveld and the gradient on the airstrip almost requires a one-way in, one way out philosophy. On Friday my sister suggested that we fly in and join them for the day on Saturday or Sunday, so we rustled up some cold meats and drinks and I started to have a close look at the trip. Zebula has a 1400m/4500ft , 13metre wide runway which is at 4300ft elevation and slopes fairly steeply from the midway point of runway 08 to the threshold of runway 26. My major concern was density altitude – I knew we’d get in just fine but it was the flying out that had me concerned – more on that later. Of course, having a trip planned for a Saturday morning was bound to annoy the weather gods and Saturday dawned with a 400-600foot overcast; OK, it was reported as BKN but to all intents and purposes it was overcast. Very occasionally there was a slight break in the cloud and I could see it wasn’t very thick – so we were almost tempted to try and blast through it. This would have been a mistake. After making hourly determinations I decided it was best to delay for 24h. Which, as it turned out, was very much the correct decision. Sunday was clear and the flight was on. Baragwanath to Zebula is a leisurely 105nm – of course cannot be flown straight line as there are TMA’s to be avoided. We loaded the cooler bags, swimming kit and ourselves and set off. Today I was expecting the slightly longer takeoff run but IBM shot up enthusiastically and it was sad to have to stop the climb at 7500ft. We cruised over the west of Soweto, over Orient Glider airfield (where not even one glider was out of a hangar yet) and then through the Magaliesberg flight training area – where I did the majority of my PPL training. Entering the GFA, we were out from under the TMA so we climbed up to FL95, above the scattered cumulus which was starting to develop and into some cool, smooth air. 30 minutes later we were top of descent for Zebula – the windsock was essentially indicating mostly crosswind with a slight tailwind component – I elected to land with the mild tailwind to make use of the uphill slope. Unfortunately we floated quite a bit on roundout and I ended up landing at the top of the hill (with plenty of room to spare) – I think the wind shifted a bit more towards the tailwind – as we were securing the aircraft someone landed a 182 downhill into the wind. The tailwind component could not have been more than 5knots and my MAUW landing roll is 400m so yes, I had some wiggle room. Wrapped up for the day – Zebula – YAK 18T on the left! As we arrived at the lodge, some cumulus was starting to develop – one large one in particular to the north of us. I called up the weather radar feed – sure enough this was developing into something. I spent the rest of the morning checking the feed every 30min to keep an eye. At the mercy of the weather, with no ability to stay late if need be, it is important to keep a close watch. Unfortunately having to worry about the weather does detract somewhat from the relaxation aspect of a morning in the bush – I would be more relaxed if it wasn’t the whole family. Fortunately, the weather didn’t develop into anything more than clear sky cumulus. When time came to leave the bases were at FL100 with 4/8 cover. Leaving Zebula presented a bit of a quandary. The wind had shifted so it was now aligned with the runway. The uphill runway. Additionally my daughter decided she wanted to sit up front so I needed to do a quick recalculation of the weight and balance – which still came in within the envelope. The wind was of sufficient strength that I didn’t believe I could justify a downwind takeoff – especially with an air temp of 36 Celsius and a calculated DA of over 8000ft. The Sling will clear a 50ft obstacle at MAUW at 7500ft DA in 690m so I reckoned if we added 10% for the elevated DA and another 20% for the slope we would be clear of 50ft obstacle (the trees at the end of the runway) in 900m, well short of the 1400m available. The wind was about 10kts which would give us back another 5% so in my mind we’d be fine. In fact, we lifted off marginally short of halfway (just at the top of the sloping section) and climbed strongly at Vx to the extent that I was turning on course as we passed the far threshold. I’m continually amazed by the takeoff perfomance delivered by the little Rotax 914. I had hoped to climb to FL105 or FL125 for the trip home to get some cool air but the cloud bases were around FL100 so we stayed at FL85 – which was a lot bumpier than the family have experienced – precipitating some nausea on the part of one member. Again we routed over the glider airfield (OK, about 3miles to the west thereof) – it is lovely to see the gliders below and the guys launching with the winch. Landing at Bara was very enjoyable – with the very rear C/G we did a wheelie for ages after the mains touched down – there is incredible elevator authority down as far as about 38kts – in fact on a proper short field takeoff the nose will unstick at 40kts. Another new airport into the logbook, another family trip living the Sling lifestyle. The only negative aspect is that the pitch part of the autopilot is STILL not working properly, which is proving to be somewhat annoying. I need to look at that again this week. The next trip is to Middelburg (FAMB) for the EAA aviation week. Can’t wait. To say that the year thus far has not been great for flying is no understatement. As soon as MGL Avionics opened this year I sent my EFiS in for hardware upgrade and that took 2 weeks – where I (obviously couldn’t fly). As that came back and it was re-installed, the wet season arrived with a bang. We’ve been laboring under a ridge of high pressure which has been driving warm moist air from the Mozambique Channel down over Gauteng with resultant overcast and showers. In fact we had about 3 weeks of continual 7/8 to OVC (mostly on the weekends). However, the first signs of the late summer/early autumn period are starting and we’ve had a week or so of fantastic flying weather. We thought we’d take advantage of this and do the “Sunday fly out to breakfast” thing. This was to be the first time we’d all gone flying as a family and would be a good test of IBM’s load carrying capacity. It should be noted that she’s no Cherokee 235 but with a useful load of 465kg four up is definitely a viable option. Sunday dawned clear despite the forecast high overcast, so we loaded up and set off for the airfield. The preflight was accomplished fairly quickly thanks to my two helpers who are getting quite good at removing the plugs, covers and the 40kg of water ballast I keep in the rear when flying solo. After the obligatory fiddle with the goPro’s we were able to start up. There was a fair amount of activity on the field as we taxied out – someone was preflighting a Samba XL, my neighbor across the taxiway was (still) fighting with the autopilot in his Jabiru and someone was doing circuits in a Robin. For only the second time since I moved to BaraG winds were favoring runway 13 and we launched without issue. I expected a significantly longer takeoff roll being four up but it wasn’t a big issue – what did get my attention was the slower climb performance – my usual stick deflection produced a Vx climb at 65KIAS as opposed to the more routine 75KIAS but there is a ridge to the south of the airfield which needs to be crossed…. Hard to get this one wrong – straight lines for the win! There is always time for more photos…. The restaurant at Parys has recently been put under new management and is now called Montgolfier’s. It’s very relaxed, cool and comfortable with a great view of the temporary parking and runway. Food is reasonably priced and tasty, service is as quick as you’d expect for a leisurely Sunday breakfast – all in all a great experience. As we started up to head home, the gliders were being pulled out, so we weren’t too surprised that it was a little bumpy – nothing unmanageable of course, but the thermals were starting up. Back at BaraG we landed uneventfully again on RWY 13 (The Sling LOVES a rear CG for landing – #Wheeliesfordays!). For a first time family trip, it was great – and the rear seat passengers remarked that they’d be prepared to spend more time back there.. I have been looking for an opportunity to take some family members flying in ZU-IBM. There is a heck of a lot going on at the moment with year end functions, prize-givings, concerts and the like and there simply isn’t a lot of time. When the Springs airport fly-in came up though we decided to make a morning of it. Some family members preferred their beds to an early flight so it was only myself and my son braving the trip to the East Rand. I tend to overthink trips to unfamiliar airspace. I’ve only been east of OR Tambo Johannesburg International Airport (FAOR) once and that was a long way wide of the airspace doing my night Nav exercise – this route would call for a very close skirting of the airspace around this large international airport. Saturday morning’s weather was fairly typical for a Saturday morning at this time of year – beautiful at 04h45, and overcast by 06h30. Fortunately the stuff was thin, was clearing from the east (good news since this was the direction of flight) and it looked like a good day to commit aviation. I try to involve my kids in the preflight process as I think that the more eyes there are scanning the aircraft, the greater the chance of picking up something – but we both had to stop and gawk as a flight of 4 motor gliders taxied past and departed to Springs – they’re quite elegant and looked like they had some pretty impressive initial climb performance. Then it was time to set sail – in the video below one can see the smile on my son’s face as we accelerated down Runway 29. The routing was easier than I imagined it would be – and much quicker too – by road Springs is a good 90min drive – took us about 24min all told. Being total newbies to the fly-in scene we were impressed by the number of aircraft joining the pattern from all directions – generally professional piloting meant that we were able to build some good situational awareness and no surprises appeared (apart from the unexpectedly strong crosswind on the downwind leg)! There is a bit of pressure landing at a busy field when you know everyone is watching your landing – fortunately we didn’t need a broom to taxi the aircraft off the runway so we retained some credibility. Which I lost for us by asking where we could park…. “Um… in any open spot?” So we pulled up next to a very pretty RV8 (ZU-RVA) and shut down. Then it was time to wander around and have a look at the aircraft – there was a good representation of general aviation in SA – everything from a Trike to a Cherokee 140, to C210 on the type certified side and lots of Vans Aircraft (Mostly RV7A’s with a spattering of RV-6/a’s and two RV-10’s – not to forget the aforementioned RV-8), A couple of Slings, Jabirus and some Kitfox aircraft on the NTCA side. A Robbie R44 and an Alo II kept the motor gliders company too. Sadly we were not taking part in the navigation rally and we didn’t have time to stay and watch the departing traffic so it was back to Tedderfield for us. 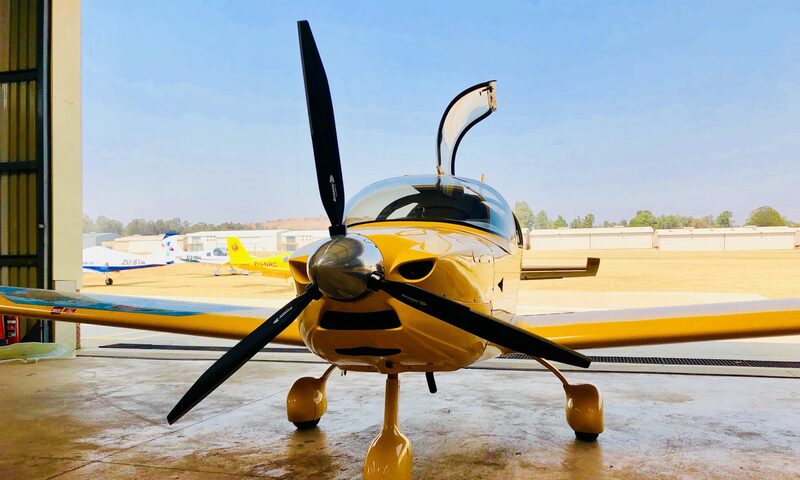 We wanted to stay well clear of the busy corridor between springs and Rand Airport so I decided to head south until passing over Heidelberg airport and then route for Baragwanath (FASY) airport – which is to be the new home of ZU-IBM for a touch and go before returning to Tedderfield. As we were doing run ups at the hold for RWY 03 at Springs there was some commotion on the airport frequency – apparently one of the motor gliders based at Springs had had an engine problem on departure from the grass runway and had completed a safe off field landing – I guess this is bread-and-butter stuff for glider pilots? We’ll be looking for more fly-ins to attend in future. Having an aircraft means somewhat more flexibility in terms of using general aviation to get to where you want on (more or less) your own terms. Of course, having an aircraft also means you can make totally financially unjustifiable trips on (more or less) your own terms. I tried to do a long cross country to a congress I was presenting at in August, in George. George is an airport with a bit of a reputation – on a small plateau on the coast behind some rather imposing mountains and some rather fiddly airspace which I’m told ATC does not ever allow you to penetrate on a VFR flight plan. I was going to be doing this trip in a rented SR20 but as it turns out the weather forecast was very marginal and I didn’t fancy my chances of getting in. Also, it’s not really fair to congress organisers to have a speaker who may not make it due to weather – so I binned that trip and flew commercial. When this congress in Cape Town came up it looked like a much more viable option for flying myself. Firstly – no really large mountains, secondly summer weather which at that part of the coast is not characterised by cloud or thunderstorms, and thirdly access to my own aircraft (so no demurrage costs for the days it would be sitting on the ground). Johannesburg to Cape Town is well within the limits of the Sling4 – range is around 750nm and with a flight plan distance of 665nm this would be easily doable. The prevailing winds tend to flow west to east so this would reduce the range somewhat and my personal limits call for never landing with less than an hour’s fuel in the tanks so a refuelling stop would be required along the way. I settled on FATP – New Tempe in Bloemfontein – about 95min flying time from Johannesburg. The plan was to leave just after sunup on the Friday morning. The plan was thwarted by various delays including me leaving my snacks behind and having to source some more food for the trip. By the time I departed Tedderfield the sun was well up – I need to plane better and arrive earlier – prefilghting and the other admin related stuff I had to do delayed me too much. PreFlight done – ready to go. The flight to New Tempe is 200 odd nautical miles – easy airspace – and with not a hill in sight – the air was clear and smooth and I thought this was going to be an easy trip. And it was – at least as far as FATP. Upon arrival at FATP New Tempe I fuelled up (sadly only Avgas available) – 41litres used for the 200nm trip – around 10Gallons. Some R66 turbine helicopters were also fuelling up – one of the pilots was wearing the whitest Flight suit I have ever seen. The equivalent of a white tuxedo. $4.00 – The processed meat special! Time to get going again! By the time breakfast had been consumed it had got very hot, so I was pretty stoked to be on my way again. Bloemfontein cleared me straight through their airspace which was a plus – but then the turbulence started in earnest and even climbing to FL105 didn’t help much. This part of the world is renowned for its gliding conditions and its easy to see why – had updrafts in excess of 600fpm at times! My smooth sailing plan was but a memory and I was basically holding on for dear life at times. Having a loaded weight of about 600kg doesn’t help when its bumpy. For the first time I was glad I was alone – I can’t see passengers enjoying this too much! Still, the discomfort was more than made up for by the views and the starkness of the scenery. We settled down at about 125-130kTAS which worked out to about 110-115 kts GS – not too shabby. It’s no Mooney but it does the job. Then it was time to get down. Under the category of “if you don’t ask…” I requested a VFR transition through the Cape Town TMA – the reason for this is that their TMA is 2000ft AGL and the mountains in the area while not high are certainly intimidating to some extent and permission to transit the TMA would keep me higher for longer and allow a more gradual descent while being well clear of the mountains. Fortunately they were happy to allow this and my arrival into Morningstar airport was very straightforward. Upon arrival at Morningstar I tied IBM down and then tried to put the canvas canopy cover on. I wish I had a camera for this. The wind was howling from the starboard side of the plane and every time I had the canopy in place and I walked round to tie it on it would blow off. Eventually I stuffed it INTO the cockpit and covered everything with it. For reasons best known to the manufacturer it has Velcro straps which are entirely inadequate for the SouthEaster. Tucked into visiting parking at Morningstar – Note lack of cover! This was the furthest I’ve ever flown myself, my longest single leg, my longest trip and the first time at two new airports. A good day’s flying! 4h at FL105 with a DA of 12500ft took it out of me somewhat – I do carry a pulse oximeter in the aircraft and used it regularly – never below 91% but still I was exhausted. I like the night life…. Some of the best video I’ve seen on YouTube of flying is in the evening – after the sun has set. Being able to fly at night obviously extends the useful flying day and also improves the options for waiting out weather and other potential delays. I’m a firm believer in having options to decrease the risk of acute get-there-itis. With this in mind I’m setting off on my first post-PPL rating – the night rating. Interestingly we have the night rating as a separate rating instead of built into the PPL like it is in the United States. The requirements are not onerous but definitely stipulate dedicated experience in the dark – at least 3 circuits at night (I’ll be doing many more), 10 hours of instrument training (5 of which can be in the sim), a 150nm cross country by night and a theoretical exam. So. Flying at night. It’s… well…. dark. In fact this surprised me because I was anticipating that the lights on the plane would be better than they are. They’re not great for taxiing on the apron so that took a little getting used to. The lighting on the taxiways at Lanseria is great so that wasn’t an issue. No delays fro other aircraft on the field while taxiing which is always a plus. Run up and pre departure checks were as per normal, although I chuckled at my instructor when she said that we’d aim for the darkest patch off the end of the runway if we lost and engine, we’d turn on the landing light, and if we didn’t like what we saw we’d turn it off again. This did bring home the stark reality of night flying – it’s really difficult to find a safe landing spot should the big fan in front decide to stop. Lining up on 07 you get the sense of how dark it is – a row of lights leading out into almost infinity and just blackness beyond – not a sliver of moon in sight even. Performance in ZS-ZIP was pleasantly surprising – 9 celsius outside temp will do that and climb out was brisk (for an SR20). The instructor had me on the gauges almost immediately after takeoff and I flew the numbers – 5deg nose up with 50% flaps at full power gave me just over 85kts (Vy) so we were at CAPS height crossing the 25 threshold which was reassuring. Then it was head down in the cockpit. The aim of the flight was instrument navigation introduction – I’ve done lots of sim time but this felt somewhat easier I thought. We did a number of VOR radial intercepts under the Lanseria TMA – I must say that the VOR intercepts are reasonably easy with it being a command instrument – fly to the needle and the only tricky bit is remembering which reciprocal to use (FROM top TO bottom). Then we climbed out into the practice area for some upper air work – clean and configured stalls (no problem) and some steep turns – again not an issue which is quite funny considering how much difficulty I had with them prior to my PPL practical test. Then some timed turns which are challenging – essentially we work out an angle of bank for the rate one turn (TAS divided by 10 plus 6-7kts) which at 130kts TAS works out to be around 20deg. Then set up on a radial, bank in to the rate one bank angle, start the timer and then try and maintain 45deg of heading change every 15seconds – 3 deg per second. Not quite as easy as it sounds but very rewarding to get right. These will be useful later in IF training when it comes to holding patterns and procedure turns. Then it was time for some ADF work. ADF navigation puzzles me from a number of aspects. Firstly, it’s a big drain on my brain to figure out which way to turn each time and secondly, they’re essentially obsolete. They’re so obsolete, in fact that our 2004 model SR20 G2 has no ADF radio on board. As a result, we have to bodge an ADF navigation exercise by using the bearing needle on the HSI to point to a GPS location and then fly using that as an ADF station. It gets the job done and perhaps it’s ADF as ADF should have been. Still, ADF intercepts are fiddly. Intellectually I know it’s a simple case of remembering where one is in relation to the station and turning appropriately. The little tricks – turning away from the desired QDM inbound and towards and beyond QDR for the outbound – do help, but they’re not intuitive – I’m guessing that practice practice practice will be the key to successful ADF navigation. Finishing up with some unusual attitude recovery (again, fun…) I considered we’d done some good work. So what is it like flying at night? I found it really serene – its you and the plane – I didn’t hear any nighttime rough running and the air was smooth (and freezing – note to self – take a better jersey next time) and calm. The lights stretch for miles and the dark patches do feel like they’re reaching up to grab you – I assumed all the dark patches are mountains because why would anyone put lights on a mountain? The best part for me is that the feeling is getting better – i.e I’m flying more by the seat of my pants than I have been before and it feels smoother – I do need to be a little bit less aggressive on my turns – I do tend to roll quite positively which works during the day but perhaps not as well under instrument conditions! We decided we were chilled enough and headed back for Lanseria. One scheduled 737 on long final and then we were to roll in onto approach. The night time approach is easier, and harder than I thought. Flying the profile is easier than during the day as less gusts and updrafts but the roundout and landing was very different. The instructor was following me on the controls – we went over the threshold at what I felt was the right height having had 2 red and 2 white on the PAPI the whole way down. Then she says “do you feel like you’re sitting on the runway?” and I say, “Um… yes?” and she says, “OK, go to idle” and we touch down light as a feather – best landing ever I think. Which would be awesome, except in my mind we were about 5feet higher and I wasn’t expecting the touchdown at that point. This confused me a little as I was convinced that one would feel lower coming in at night. There is no centreline marking on the runway so the only visual reference is the side lighting – guess I need to pay more attention to that in the coming flights – which should be two sessions of night circuits. Can’t wait. Flying with the Family – 1 and 2..
How do you make having a pilot license feel real? Fly with those who are most precious to you. For just over a year now I’ve been disappearing off to the airport for protracted periods of time and bringing nothing back other than stories of where I’ve flown, or how bad or good the conditions were or which exam I passed. I think it’s been a little hard on the family to be contributing (by managing without me at the house) but not getting any significant return. So, it would be that my wife and daughter would be first to fly with me. I hummed and hah’d about the routing. I wanted to do the city tour but decided to stick with what I know and simply cruise up and down in the flying training area. This turned out to be a very good call – as I was SO nervous that additional navigational demands would have seriously impacted my ability to fly safely. It gets real very quickly when your family is on the aircraft. So how did it go? It was….. OK. The flying was good, the GF was quiet and I even threw in a steep turn to make sure everyone was awake. I gave the lecture (pre departure) on not talking while I’m on the radio and to let me know if they see any other aircraft – my daughter saw lots – I want her as my copilot – I’ll call her “Eagle Eye” from now on. The only downside was that it was pretty bumpy with the wind from the south rising up over the ridges and causing a little bit of turbulence. Landing was within spec (I thought it was pretty poor but the passengers thought it was ok) and just like that… I’d taken my first passengers for a plane ride. More importantly, they both say they’ll fly with me again. This is the best part – because what is the use of the PPL if you aren’t going to use it to take people places? My little girl did get a headache which I put down to an uncomfortable headset (loaner) and possibly also being in the back seat without a cushion – note to self – remember the cushion next time. My wife seemed surprised at how methodically I did my preflight and that I kept checking and double checking everything – I like to think I’m very cautious – this is what I normally do! I believe that I inspired confidence in her. The second flight en famille was this last weekend – I took my mother-in-law and my son up. This would be a lot less pressured as I’d broken the back of my nervousness to carry passengers. I wanted to do some short field work so I took them out to my usual hunting ground Rustenberg(FARG) for a landing – it also gave them a chance to change seats – my MIL did the right seat out and my son back. So FARG was extremely busy. I’ve never seen it like that before. When I called 10nm out there were 3 aircraft already in the pattern (one orbiting to drop parachutists) and 2 others inbound – which is a lot for an uncontrolled airfield. We’ve been suffering under a heavy high pressure system for a few days now – the QNH was 1038mmHg (30.65in) and I forgot to set to local until well into the descent which left me a little lower than I wanted to be for the overhead join but fortunately I was at the front of the queue and was able to recover on the downwind leg. Schoolboy errors..
Hmm. Didn’t seem like the best advice but after checking again to see they were not on the upwind and as I was departing straight out I decided to go for it. Didn’t see them at all. I even looked back after takeoff and didn’t see them. Oh well. I’d have been much happier to have eyes on but since the drop pilot didn’t even know how many jumpers he had, it seems like it wouldn’t have been that helpful to have seen some. I’d be interested to know what the procedures are at other fields where skydiving occurs. To me the safest approach would be to halt all ops until the divers are all recovered onto the field but I’m not that keen on sitting there with the Hobbs running while people drift down 4000ft under canopies. But back to Lanseria we went only to find that every man and his dog was, in fact flying today. We were 4th inbound to the left downwind with a B737 on long final and 2 on the right downwind – Orbits, orbits for everyone! But the best part (after having to fly a 7mile final) was that the wind was blowing directly down the runway. I think this is only the second time in my flying career and we made an absolute greaser. Top tip – when flying with your mother in law, make every landing a greaser. Another 1,5h in the logbook and cross country time to boot. I want to do my PPL(Instrument) so I need to log the cross country hours. Also starting the night rating so doing some sim hours too. The best part is that on reflection I don’t remember having to work too hard to fly the plane this time. Maybe I’m getting that feel – finally. There is something about flying yourself for the first time with a freshly minted PPL certificate. No instructor to sign you out. Nobody double checking the tanks and the oil to make sure that you’ve put the caps back properly. It’s weird. But in a good way. I decided that I wanted to practice my landings and circuits mainly to keep current and proficient. Well. This was a lesson to me. This was going to be one of the worst flights I’ve ever done. 5 circuits. 2 reasonable landings. 2 balked landings (one from a PIO which got very scary very quickly – fortunately I remembered Thomas Turner’s One-Bounce-Rule and quickly got on the power and was away). The second balked landing was the scary one. I had a big bounce and wasn’t about to try my luck again – Full throttle but she just wouldn’t climb – so I ended up floating about 50ft above the runway for a while until airpseed built – in retrospect I should have triued to recover the landing with a bit less power to level off and give it another go – it’s a 10,000ft runway so there is almost always a chance to correct the landing – although this feels like cheating becasue not all runways are 10,000ft long! So I left the field somewhat demoralised but have thought about it a lot and played through the scenarios in my head. I know what was wrong (poor airspeed control) and this is fixable – and to be honest the conditions were lousy – significant turbulence and variable winds on the final approach made nailing the airpseed somewhat tricky. Next week is another week – and it’ll be the first flight with my wife and daughter.